Back cover blurb: When Louise Williams receives a message from someone left long in the past she feels sick. Maria Weston wants to be friends on Facebook. Because Maria Weston has been missing for over twenty years. She was last seen the night of a school leavers' party, and the world believes her to be dead. Particularly Louise, who has lived her adult life knowing herself responsible for Maria's disappearance. But now Maria is back. Or is she? As Maria's messages start to escalate, Louise forces herself to reconnect with the old friends she once tried so hard to impress, to try to piece together exactly what happened that fateful night. But when another friend's body turns up in the woods outside their old school, Louise realises she can't trust anyone and that she must confront her own awful secret to discover the whole truth of what happened to Maria . 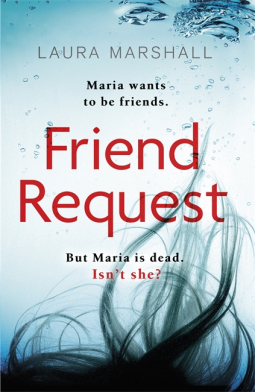 . .
Until Louise realises that her friend request is from a 'friend' who's been missing presumed dead for more than Twnety Years - Maria Weston. Suddenly Louise is terrified and not only for herself, but for her son as well. Because Maria Weston has been haunting Louise in all the time she's been missing. She feels guilty about the last time she saw her, the school leaver's party. What she and a small group of friends did to Maria that night has been eating Louise up inside for years. Despite her better judgement Louise gets in touch with an old school friend Sophie, who asks her if she's going to the forthcoming school reunion. Louise was undecided, but she thinks it might be a good way to try and find out who's behind Maria Weston's facebook page. When she arranges to meet up with Sophie before the reunion, Louise gets the sense that she's being watched, followed. But she tells herself not to be stupid, paranoid. Nobody is interested in her. But then she gets a message from 'Maria' and is suddenly more afraid than she's ever been before. Friend Request is available now via Amazon online and all good book shops.